The MultiFaceCard III is a full length Zorro II card providing 2 extra high speed serial ports and 1 extra high speed parallel port. 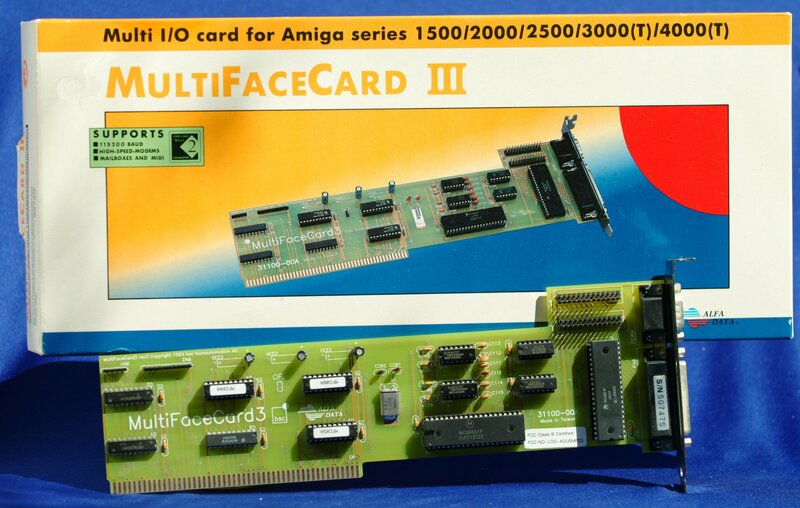 The MFC card uses the 68681 serial UART, which has a three-byte FIFO buffer. As this port is bidirectional, it can be used with a special version of ParNet found on the install disk. There's no ROM or EPROM on the card, and thus no drivers that autoconfig. You have to run the MFC program which provides the "duart.device" for the serial ports and the "pit.device" for the parallel port. if signals not present on the DB9 connector are needed.